In 2002, Bill suggested that a Chinese flag should be hang at Pudong Airport. I thought it was a very nice suggestion, and we should do it. I also suggested to the Tourism Bureau but didn’t get any response. I am happy that during my trip, when I returned from Hong Kong, I found this big flag at the arrival hall of Terminal 2 of Pudong Airport, just before the investigation point for passport. May I also complain that the Terminal 2 of Pudong Airport, as many airport is completely empty without any decoration of posters or banners. It was so boring to walk from gate 69 all the way to the arrival hall – 15 minutes without anything to read – just feel very lonely when you happen to leave the airplane late. Previous PostHong Kong Not More Expensive Than ShanghaiNext PostHow Many of My Readers Use FaceBook? I have not been to many foreign countries, but I remember in some US international airport they have words in all kinds of lanauage welcoming visitors, and in one case I saw Oracle (the software company ) Ads. I remember seeing lots of Siemens Ads (bulliten board) in Beijing international airport. They should put the flag better horizontally. The yellow stars pattern looks disturbingly like a smiley. 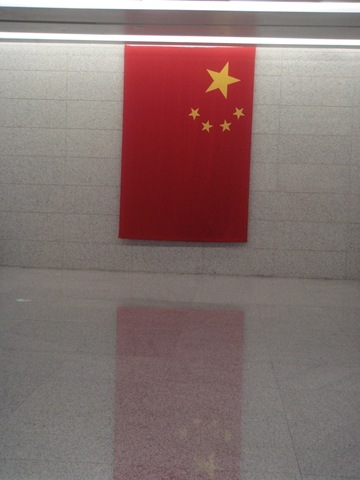 I saw this flag in October when we arrived in Shanghai. I thought it looked nice as well, and relieved the monotony of the long corridors and open spaces. But what really impressed us this time was the junior border agent (female) who accepted our travel papers with a smile, reviewed them, and then welcomed us to China. After being in transit for 14 or 15 hours, it is really nice to feel welcomed when you finally get there. This bloody flag means terror. Have you watched 海角七號 yet? Please watch it and post comments, thanks!